At the time, the National Union of Mineworkers (NUM) seemed embarrass to receive support from gay people – so the campaigners decided to ignore the union and go direct to the miners. They identified a mining village in deepest Wales and went to make their donation in person. The journey resulted in two different communities forming a successful and emotional bond. PRIDE is being directed by the Tony Award winning theatre director Matthew Warchus. Pride is shooting for 8 weeks in London and in Wales throughout winter. 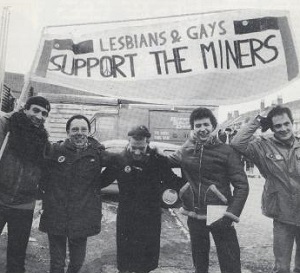 The historical website Gay in the 80s gives greater detail of how gay rights campaigners helped the miners during their fight against the Thatcher government. The strike ended without victory for the miners.